The system retains all of the functionality of the Zetasizer Nano ZSP and adds Raman spectroscopy to determine secondary and tertiary structure of proteins and protein-based biotherapeutics. This wealth of characterization data provided by a single instrument platform provides the understanding to enable more efficient drug development processes, shortening time to market, and increasing drug product quality. The exceptional performance also enables the measurement of the molecular weight and second virial coefficient, A2, of macromolecules and kD, the DLS interaction parameter. Information can be derived from non-experts through powerful software – where trends of a pre-determined set of parameters are graphed and fitted with no expertise required. To keep from sacrificing analytical power though, an advanced processing mode provides a full suite of tools – from data pre-processing to multivariate analysis. The use of the instrument is therefore enabled for applications method development. Advance data analysis tools include a full suite of spectroscopic analysis tools, from pre-treatment to multivariate analysis. 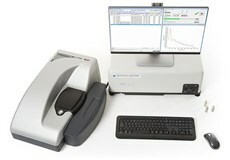 Malvern Panalytical provides materials and biophysical characterization technology and expertise. There are no threads in Malvern Panalytical Zetasizer Helix Reviews at this time.